Allowing the architecture of a space to take precedence, AbakEnvironments looks as smart as it works. The slender profile and translucent and reflective materials allow a consistently elegant and contemporary look. AbakEnvironments lets you create all kinds of workable spaces – open-plan environments, meeting areas, private offices – with a broad array of simple, totally non-modular components. 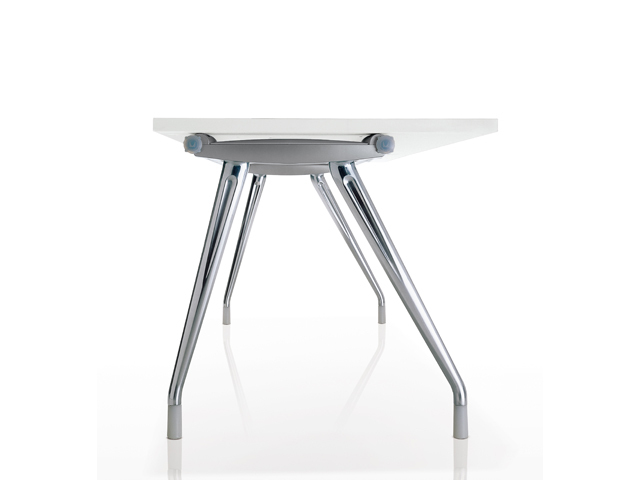 Free-standing desks, linear arrangements, meeting tables or spine-wall configurations are easy to specify and install. Sturdy twin beams connect at 90 or 120 degrees; legs attach to the beams; beams support work surfaces and screens. Surfaces and screens can be attached at any point along the performance wall or beam. When Tim Wallace was 11 years old, he and his family moved from England to Pennsylvania. "The three years we spent living in Pennsylvania had a huge impact on me", Wallace recalls. "It really broadened my horizons. I came to the US as a naive little English kid and left with my eyes opened to how big and diverse the world is." Living abroad was the catalyst for Wallace's love of exploring, which has served him well as a furniture designer. "I like to gather information and learn about all the issues from as many places as possible when working on projects", he says. "I do a lot of research before I actually start to design." Designing for an international market has its own set of challenges. Although working on AbakEnvironments crossed many cultural lines, "We came up with a set of core components, or families,that can be put together in different ways to shift the emphasis, depending on particular needs", says Wallace. "It was a fascinating project to work on, and what we achieved was enormously satisfying." Wallace says that he's part of a small group of UK designers who are trying hard to influence the industry overall. "My goal when designing furniture is to make it relevant for the way we live. It shouldn't be exclusive or impenetrable. It needs to be accessible to everyone." Dust regularly with a slightly damp, soft, lint-free cloth. Wipe dry with a dry, soft cloth in the directionof the wood grain. Spills should be immediately wiped up with a damp cloth. Apply a good quality furniture polish with a soft cloth. Do not use aerosol-powered cleaners or polishes. Also, do not use polishes containing waxes or abrasives, or polishes that are oil based. Herman Miller veneers meet strict testing standards for resistance to wear, light, stains, water, and pressure. To reduce the risk of damage, take some precautions: Use coasters for glasses and mugs. If a glass top is added to the veneer surface, be sure it rests on felt pads. Don’t place a potted plant on a veneer surface unless it’s in a water-tight container or in a drip tray. Don’t let vinyl binders stay on a surface for very long. Use protective pads under equipment with “rubber” cushioning feet. Some chemical compounds used in the feet on office equipment, such as printers and monitor stands, may leave permanent stains or marks. We've been talking about design for over 100 years. We'd like to continue the conversation with you. I consent to Herman Miller having my name and email address, for the purpose of sending updates by email about their products and services. I understand that Herman Miller will not sell my personal information, and that I can unsubscribe at any time. * This field is required. Please tick to continue. '); $('#dr_downloadInformationFAQ,.dr_q13,.dr_q14,.dr_q17,#dr_backUpCD,#dr_EDS,#dr_reDownload').hide(); $('#dr_shippingInformationFAQ .dr_q5, #dr_ShippingInformation .dr_q5').hide(); $('#dr_trackingNumber').text('Get your delivery tracking number or view the delivery status'); $('#dr_ShippingInformation h1').text('Delivery Information'); $('#dr_ShippingInformation .dr_q6 dd').html('Unfortunately, you cannot change your delivery address after you submit your order. All orders are immediately sent to our fulfilment team once submitted, and our system can no longer retrieve or change them. If your order is not successfully delivered it will be returned to the fulfilment warehouse and a credit will be made to your account. '); $('#dr_ShippingInformation .dr_q2 dd').html('If your order has been dispatched, click here to look up your tracking number. Please be aware that some delivery methods do not come with tracking information. '); $('#dr_ShippingInformation .dr_q1 dt a').text('Has my order been dispatched? '); $('#dr_ShippingInformation .dr_q1 dd').html('Click here to look up your order and see the delivery status. '); $('#dr_OrderInformation .dr_q9 dd').html('Delivery fields will appear during checkout so you can enter a delivery address..
How accurate are the colours shown for each product? Can I order a fabric swatch before choosing an item? Where can I see your products to try them out? Do your products require assembly? How do I care for my furniture once I\'ve received it? I can\'t find the Herman Miller product I was looking for. Where can I buy it? I need to purchase larger quantities or modular office furniture for my business. Can I do this online? How do I arrange for a product to be serviced or repaired under warranty? I don\'t know where I purchased my product. If you made your purchase using a credit card, you won\’t be billed until your product has been dispatched. Please note that online statements for credit cards and debit cards may display a pre-authorization of funds immediately after purchase. Pre-authorizations are typically removed from your credit card transaction history when the full charge processes and funds are withdrawn. However, in some cases, this process can take up to 2 business days for credit cards and 7 business days for debit cards. If you need assistance removing a pre-authorization from your card transaction history, please contact your bank or financial institution. All payments made through PayPal will be billed immediately in accordance with their specific Terms and Conditions. Do I have to pay sales tax or VAT? The prices shown for our products include VAT or sales tax, where applicable. Any VAT or sales tax charged will be indicated and itemised once your billing and/or shipping address have been entered during checkout. The price indicated includes anticipated VAT that we will collect from you based on information you make available to us. The total price may change during the course of the shopping session depending on a number of factors. However, you will have the opportunity to review the final price we will charge before you submit your order. This VAT may not be shown as a separate charge during checkout and may instead be included in the product price (VAT inclusive pricing). There is no charge for delivery. We are currently only able to deliver within the United Kingdom. Please click here to find a stockist or retailer outside the UK. The Herman Miller, Ltd store by Digital River offers a 14-day money back guarantee. Physically delivered purchases that are in stock are processed immediately upon completion and may not be able to be cancelled prior to delivery. If your order cannot be cancelled, you will get an email notification when the order is dispatched. You can also look up your order to view the delivery status. To request a cancellation, please contact Customer Service. After receiving your returned product(s) your refund will appear in your account within 5 to 7 business days. Please be aware that if you purchased using a method other than credit card, you may be prompted to provide bank details so we may credit your account.